Loyal players can take advantage of a great bonus at Touch Lucky Casino. 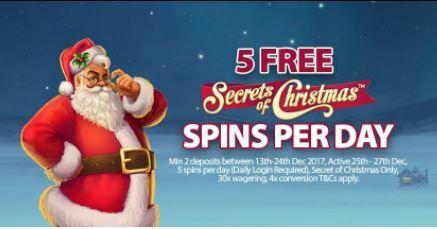 You can receive 5 bonus spins every day from 25th until 27th December. In order to be suitable for this offer, you must have made at least two deposits made between 13 and 24 December. Log in daily to claim your 5 No deposit Spins. Use them on Secret of Christmas. Meet the 30x wagering requirements before you make any withdrawals. Don’t let this chance slip away and get your hands on this bonus right now!